The accelerated pace of commercial and residential growth around southern Utah raised concerns for a group of Kanab residents who decided that adoption of a night sky friendly lighting ordinance for their city could be an achievable community service project. The “Starry Sky Working Group” was formed, and a flow of citizen engagement helped the group achieve its goal through community education efforts. These efforts included newspaper and online articles, letters, imagery and informational forums about dark sky preservation. After receiving approval at an initial presentation made to the Kanab Planning Commission, a team of residents got to work. Leaders Rich Csenge and Donna Huntsman, serving on Kanab’s Beautification Board, engaged community residents, business owners and elected officials with patience, perseverance, and respectful listening to help bring about the decision. Momentum from the burgeoning worldwide dark sky movement and encouragement from the Utah Office of Tourism helped. Through an ongoing process of research and community education, interactions and dialog, numerous revisions were made to the proposed ordinance. In the end, broad public participation secured a legacy of starry night skies for southern Utah residents and visitors for generations to come. Using the best components from outdoor lighting ordinances already enacted in four towns and cities from Utah, Arizona and Texas, plus IDA’s model ordinance for small cities, the team skillfully crafted Kanab’s new ordinance to meet the needs and ethos of the community. The International Dark-Sky Association and the Colorado Plateau Dark Sky Cooperative provided indispensable assistance and consultation. The team surveyed community sentiment and reached out to business owners, plus conducted an audit of downtown business and residential neighborhoods and presented findings to city officials. Many hours of research and study plus attending several inspirational and informative dark sky workshops paid off! Three simple but very critical provisions of the ordinance set limits on brightness, require shielding, and keep colors in the warm white part of the spectrum, at 3000 degrees Kelvin or lower. “Quality outdoor lighting for commercial, residential, municipal properties and city streets will improve public safety and security in the City of Kanab, making neighborhoods and our downtown more attractive by reducing glare, light clutter, excess brightness and sky glow,” said Starry Sky Project Co-Lead, Rich Csenge. Simple, neighborly enhancements such as shielding and aiming lights downward not only preserve the extraordinary natural darkness of the starry skies within and around the city, but also help assure that nationally significant parks, forests, monuments and public lands, as well as the nearby Kaibab Paiute Indian Reservation, the world’s very first “International Dark Sky Nation,” receive less spill-light that would diminish their exceptional nighttime darkness. Kane County, on the western edge of the Colorado Plateau, boasts some of the most remarkable landscapes in the world. Kanab, Utah is one of several small gateway cities to the region, and is large enough to offer comprehensive services for travelers visiting the Colorado Plateau, but small enough to still retain its natural darkness. Some of the best known aspects of the Plateau’s astonishing world-class “natural heritage” are preserved by more than a dozen National Parks, Forests, Monuments and Public Lands. Outstanding destinations for outdoor recreation and enrichment are within a half-day drive of Kanab. These places include Zion, Bryce and Grand Canyon National Parks, Grand Staircase-Escalante, Cedar Breaks, Grand Canyon-Parashant, Pipe Spring and Vermilion Cliffs National Monuments, as well as Coral Pink Sand Dunes and Kodachrome Basin State Parks. Some of these iconic protected landscapes already feature International Dark Sky Place designation. As a requirement of the IDA designation, Dark Sky Places have established night programs in their visitor service mix, and all have exceptionally high quality night sky clarity. Others have submitted applications for dark sky status to IDA as part of a grand vision for a Great Western Starry Way, linking public lands and communities with exceptional night sky visibility across America’s Intermountain West from Montana to Arizona. Two-thirds of the world’s population cannot see the Milky Way from where they live. Within the U. S. that number is even more startling. Fully 80% of Americans are unable to see the wonder of our galaxy at night from where they live! So it’s not surprising that increasingly, visitors to the American West want to experience the thrill of seeing the stars and Milky Way during their vacations. Visitors are expected to spend two and a half billion U.S. tourism dollars on the Colorado Plateau over the next ten years to experience the night sky during their vacation trips. Therefore it’s both smart policy and good business to improve the quality and effectiveness of outdoor lighting that preserves our view of the heavens. 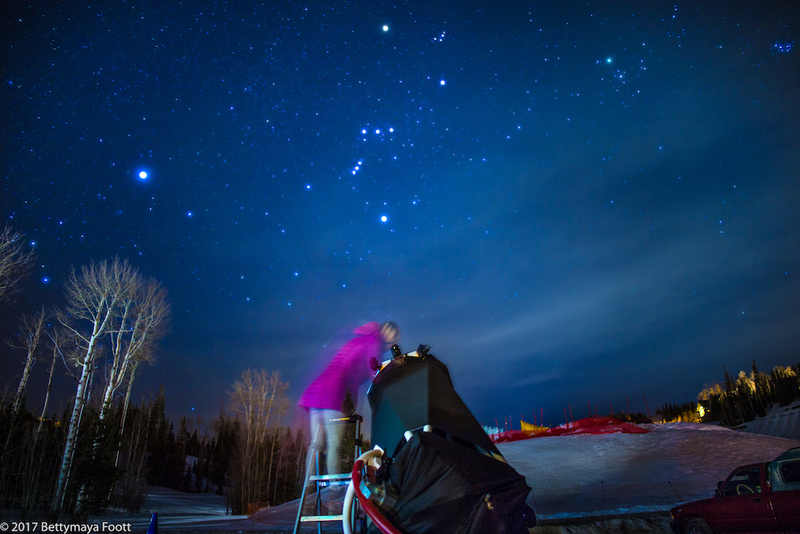 In a fruitful conclusion to a worthwhile project, City leaders agreed, and the community of Kanab, Utah, joined the growing movement worldwide for night sky appreciation and preservation. Maybe the same could happen in your hometown as well!